CHICAGO (WLS) -- Illinois and Indiana have been ranked among the nation's most unfair tax systems in the country. Indiana's tax system was ranked the 9th-most unfair, while Illinois' was 5th. Tax systems vary dramatically across states and localities. Some states don't have a sales tax; others don't tax income. Many families face high property-tax burdens whereas others enjoy generous tax credits. Personal finance website WalletHub examined the diversity in taxation policies to answer the question: Which tax systems are most fair? WalletHub used the results of what they call a "nationally representative survey" that assessed what Americans think a "fair" state and local tax system looks like. Most Americans think "fair" state and local tax systems impose higher taxes on higher-income households than on lower-income households, WalletHub said. According to WalletHub, Illinois is the third-worst state for overtaxing the poor. Indiana ranked 9th on that list. Indiana ranked 6th for the state where the middle class is most overtaxed. Illinois ranked 10th on that list. 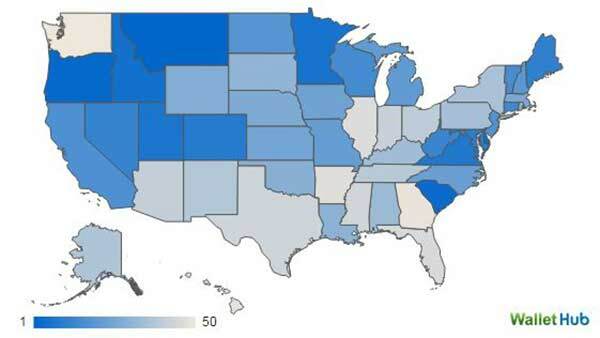 The wealthiest 1 percent are most undertaxed in Wyoming, Nevada and Florida, WalletHub said. Illinois also ranked as the 7th-most dependent state on property taxes.